One of the first cookies my Mom taught me how to make were meringues with bits of toasted walnuts and dark chocolate chips. Eventually it became a signature cookie for me, the first recipe that I memorized. I could whip them up at a moments notice, and in fact, I did just that several times, the first occasion when I was fourteen and working as a mother’s helper. The Mom needed a cookie to serve with coffee and I offered to make them on-the-spot. I should have gotten a bonus that week. She was not as impressed as she should have been. They became the recipe that made me feel competent in the kitchen, that emboldened me to try new ones. With every successful batch, I experienced a confirmation of my talent with baked goods. But the recipe was not always that simple, especially the first time. My Mom had a large copper bowl that hung in her kitchen. In fact, she had a long row of copper pots and pans hanging from a strong brass rod. While she used the pots all of the time, I had never seen her use the bowl. It was meant for whisking egg whites, so it made perfect sense to use it for this recipe. My Dad had bought her the bowl in Paris at the famous cookware shop Dehillerin, years before; it would finally get the workout it deserved. The version of the recipe we were using came from my school’s fundraiser cookbook. They were called “Surprise Meringues” and my Mom and I were in for a surprise that had nothing to do with the crunchy bits hidden inside the meringue base. We separated our eggs and placed the whites in the bowl. My Mom explained to me that the copper reacted with the protein in the egg whites and would help stabilize them. I was eight years old and this was the first time I had ever heard this interesting bit of information, which I have never forgotten. She picked up a large balloon whisk and started beating the whites. The bowl had a little metal ring, right under the lip, that you could slip over your thumb to help hold the bowl still. The whites began to loosen up and become frothy. First I could see larger frothy bubbles, then the bubbles became smaller and eventually the mixture turned foamy. At this point my Mom had been whisking vigorously and continuously for several minutes. “My arm is tired. Your turn!” she directed. I went at it with gusto, watching the egg whites for the desirable change. We were trying to get them to a soft peak stage, which I accomplished during my round. We switched again and my Mom whisked while I slowly sprinkled in the granulated sugar. “Now we have to whip them until the firm peak stage,” she explained. We would know we were done when a peak of the thickened mixture stood up straight. She beat it quickly with a rounded, whisking action. I took another turn, then she did, then I did again. Both of our arms were quite tired at this point and I was beginning to wonder if all of this was worth it. She tested the mixture. The peak flopped over; we weren’t there yet. We beat some more and eventually the egg whites firmed up. We added vanilla extract and folded in the chopped nuts and chocolate morsels. We formed the cookies with two teaspoons, using one to push the meringue mixture off of the other on the prepared baking pans, lined with brown paper bags cut to fit (we didn’t have parchment). After baking in a low oven, they were dry and crisp, but still sparkling white. You could see shadows of the nuts and chips right under the surface, hinting at the textures and flavors within. They were a hit. 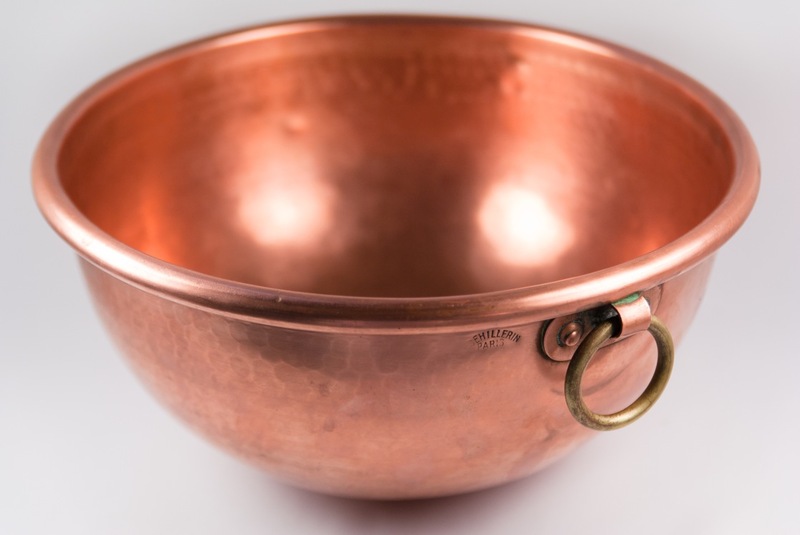 I made this recipe again and again over the years, but never again with the copper bowl. The next time my Mom and I made them, we used a hand mixer. Nowadays I use my standing KitchenAid mixer and it takes just a few minutes to prepare the whole recipe. But the initial difficulty and eventual ease of this recipe are not really what this memory is about. What’s important is how a simple recipe, from a small spiral-bound self-published cookbook single handedly launched my kitchen confidence. The elbow- grease was worth it, after all.